Porch & Den Chartres Trellis Grey Area Rug - Gray - 5'3" x 7'3"
Add luxurious softness to your floors with the Touro shag rug from Porch & Den. Made from durable polypropylene, this rug will not shed and is stain resistant. The contemporary Moroccan trellis pattern will complement many home decors. I have been so happy with this rug. It is beautiful and soft, and doesn't shed. The colors are even better than the photos, I would say brighter even. I spent so much time looking for something I could have in my living room, but still something my baby and other kids could play on without having to worry about it getting matted down or worn looking. We've had it for about 2 months now and it's exactly that, just what I was looking for. The quality is superb, I couldn't ask for a better one. I'm very happy with my purchase. I ordered the Porch &amp; Den Marilyn Touro Trellis Rug to coordinate with my new living room furniture and it's probably my favorite piece of decor. The ivory and gray tones work perfectly in my room, the quality is great, and it came on time without issues. Total Score! I am very pleased with my purchase. I was looking for a rug with a modern and stylish look, a rug that would stand the test of time in both looks as well as durability. I found both a beautiful rug and one that is well made and durable, yet elegant, with this rug. The Moroccan pattern is so nice and even leans to a classic look that will be in style, although trendy, and will still be in style for years to come. I would highly recommend this rug. It is even more beautiful in person than in the photo. I cannot stress enough of what great quality and how very well made this rug is. The colors are vibrant and compliment my den perfectly. Very pretty colors... a bit lighter than the pictures but same tones. Very soft under my feet... I did have to use a non slip pad to keep it from moving. But overall I am very pleased!! I love overstock!! This rug arrived first in the wrong color but Overstock was fantastic about helping me return it for the correct item. When I received the rug I was impressed with the overall quality. It's a nice mix or shag but not too shaggy! The colors are true to the picture and I love the fact that I was able to get the same rug in a variety of sizes so all my areas are perfectly coordinated. I definitely recommend this item. Not sure how well it would do in a very high traffic area like a hallway because of the high pile of the rug. Super soft and exactly what I expected. I would definitely recommend this rug. I placed a good rug pad under it so it has extra cushion. I am very pleased with this rug. Perfect pile height for vacuuming, as well! So beautiful and thick. I’m very pleased! I highly recommend this rug to others. It goes very well with my colors especially the yellow. I believe everyone will be pleased with this rug if purchased. The colors are lovely, and the corners were all laying flat by the end of the day. Very happy with the rug!! I have it in my living room, but after seeing that the colors are a little lighter in bright light, I think it would be precious in a nursery. This runner is average for the money that was spent on it. I liked the soft gray colors and the overall look of this rug. However i haven't had this rug very long and I feel that this rug is not holding up to the high traffic area that it is in . Great rug- high quality and very soft. It's not a cheap-looking, nor does it shed fibers like other similarly priced rugs I've purchased in the past. It's also really good at disguising dirt, which is a plus. Gorgeous rug goes well with my decor. I'm usng this in my living room, beautiful design. I purchased one for my bedroom!!! These rugs were a good find. You won't regret your purchase!!! Great quality at a fantastic price! This rug is exactly as pictured. It's soft and looks great in my living room. I have two large dogs who shed and this rug has been really easy to keep clean so far. Shipping was quick &amp; easy. I got this area rug to put under my dest in my home office. It really tired the room together and added style it. Great Buy !! It has wonderful Morrocan design. The colors are warm and can be paired with neutral painted walls. Very nice rug. Love the colors and the feel of it. The colors and pattern went perfect in my bedroom. Excellent quality. and oh so soft on the feet. I will look for these rugs in a smaller size for the bathroom. I love the softness and colors of the rug. 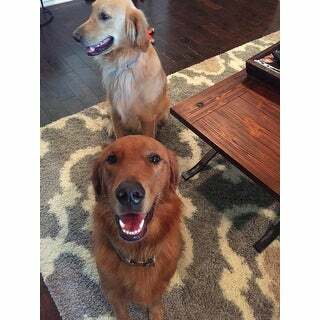 The kids (and dog!) love lying on it. It fits perfectly in the room, and still looks brand new when vacuumed. What a gorgeous carpet! Love it in my living room! Great quality and a perfect addition to my decor! Will definitely order this brand again and from overstock! Love the colors of the rug. It’s not as full as I would have liked for it to be. I have 4 big dogs and the shag threads are already coming off of it. This rug looks and feels great. The colors are vibrant and the carpet is plush. This was exactly as pictured online. Overall, I'm very happy with this purchase. "is the red actually a red red or is it more of the burgundy variety?" "Does this rug come in a matching 2 x 3 size?" It’s currently out of stock. Item # 27715050. "Do you have the Porch & Den Marighy Touro Trellis Grey/Cream Shag Rug in 5'x7' are close to this size?" 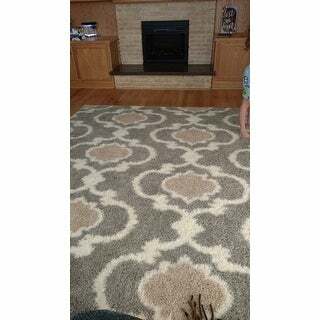 "I have seen this rug on other sites with exact dimensions and it is a 10' by 12' rug. Can anyone confirm that this is 10' by 14'? I realize that there are variations in all rug dimensions but a two foot difference is a bit much. Thanks for any help you can provide!" We do not carry 10' x 12' size. We do carry 9' x 12' and 10' x 14'. 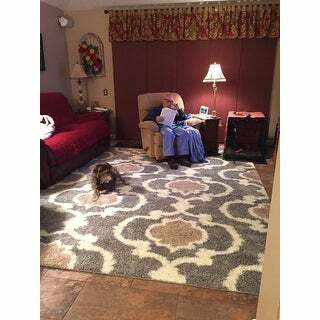 "Need too order bigger size how too I check on that "
We do offer the rug in 7'10 x 10' under item# 18180275. 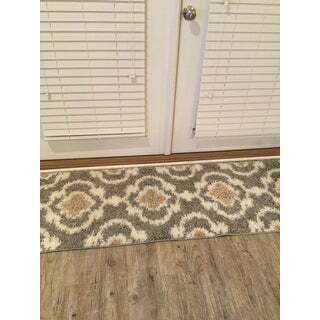 "is this rug gray and turquoise or what it doesn't say"
"What colors are in this rug "
It is a light cream/white and a light grey according to owners.